Be guided through the exercises and information that will transform your life and future in this complete ONLINE course. As an international trainer of NLP and hypnosis, I keep up with and teach the latest cutting-edge mindset technologies. 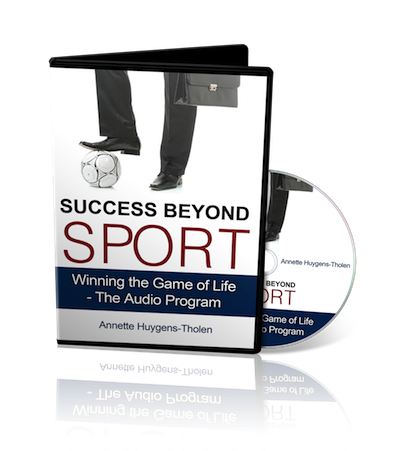 I have incorporated these, along with my personal experience of transition, as a retired Olympian, into Success beyond Sport – a program that takes you step by step to the person you want to be and the lifestyle you want to have. I will take you through visualizations that accelerate your transformation. I went from Olympian to International Speaker/Trainer/Coach traveling the world, with a home in Hawaii and an amazing marriage. Instead of feeling lost and confused –> HAVE CLARITY on your current situation and where you want to go – BE EXCITED about your future beyond sport. Instead of struggling financially –> RELEASE BLOCKS around money and wealth and be free to accumulate wealth and resources and have greater choices in life. Instead of feeling down, depressed or experiencing low self- esteem –> HAVE CONTROL of your emotional state and find the happiness from within to be happy, content and confident with whatever life throws at you. Instead of holding onto your past –> Let go of your past and EMBRACE THE PRESENT so that you can see the opportunities around you now to create a new story of success. 1 – Take Responsibility -Understand the mind and how go get in charge of it to create better results both now and for your long-term future. 2 -Set your Targets– Get clear on where you want to go and learn EFFECTIVE goal setting methods that will align you to reach your target. 3 – Believe it to see It – You need to believe in yourself and your dreams in order to move forward. Find out the blocks holding you back and how you can change. 4 – The Rules of the Game are rules you play by and it’s effect on your priorities in life. Understand why you are getting your current results and learn how to change for long-lasting results. 5 – Play like a Winner – Learn to master your emotions so that you can show up in life as you desire. Get in the zone for your new career. 6 – Develop a Dream Team – who do you need on your team to accelerate your progress? 7 – Make it Happen teaches you time management and planning skills which will help you to take the action you need to make your goals happen. Includes templates and planning tools to download to make it easy for you. Match Point will fine-tune your skills so that you leave the Success beyond Sport program with a new mindset and the tools to put a plan in action. Planning tools to help make your transition even easier. Listen to each session’s recording in your own time and review as much as you need to. 1. Bonus Interviews and Training Calls – Listen to recordings of past expert interviews and coaching calls and there are e-books. 2. 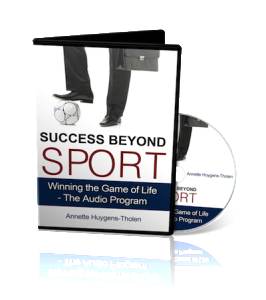 Bonus Ebooks/transcriptions of interview to read and further assist your transition. Topics include: Money management; Health; Power of Focus; Olympian Archetype; Business of being an Athlete; Dressing for Success……and more. With our RISK FREE trial it’s easy to do something about changing your future today. **RISK FREE MEMBERSHIP** – I’m confident that when you participate in the Success beyond Sport program, you’re going to be rapt. I also know that if you participate fully and commit to doing the work, you will start transforming your mindset and your results. I will back this up, with my risk-free payment guarantee – if you decide within 30days, that this program did not fulfill expectations and was of no use to you, then let me know and I will refund your joining fee. No questions asked. IMAGINE enjoying that WINNING feeling in everything you apply your mind and heart to. I know what a difference the teachings have made to my life and I only want you to have the same opportunity I did to learn these tools. One of the biggest lessons I have learned is that you don’t have to do it on your own. So let me help you succeed.